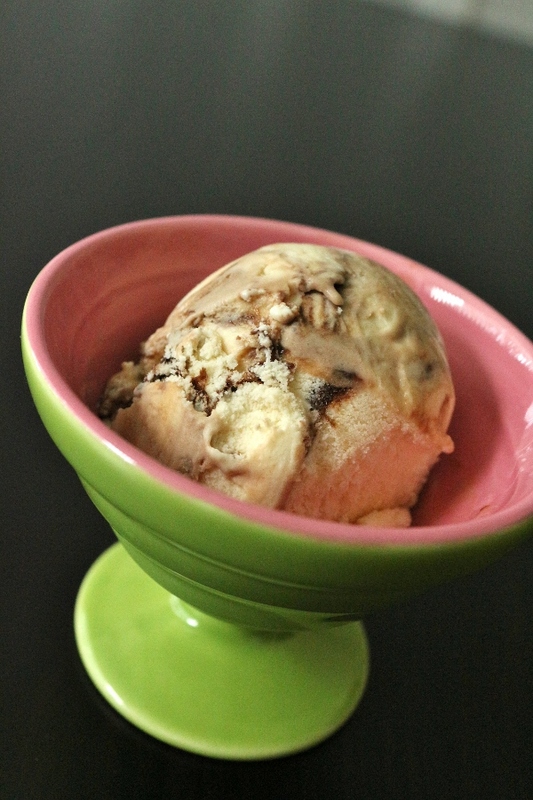 Summer is a time for the beach, barbecues, and of course ice cream! Although I do enjoy ice cream year round, I can't think of a better time to enjoy it than when you need to seriously cool down... right around now. Luckily, I recently received a review copy of Ruby Violet's Ice Cream Dreams written by Julie Fischer and published by Hardie Grant Books. It's based on a popular British ice cream shop (or should I say shoppe) that creates luscious ice creams featuring organic milk, free-range eggs, and fresh seasonal ingredients (no additives here). 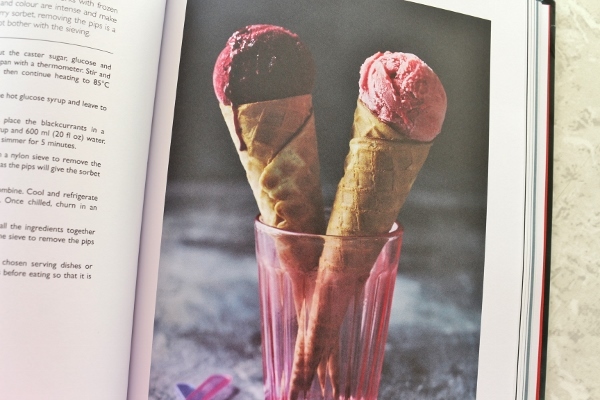 The book begins with basic sweetened and unsweetened ice cream mix recipes and follows with basic sorbet mixes (including homemade glucose syrup made from glucose powder). I was surprised to see this glucose syrup used so frequently in many of the book's sorbet recipes, but Fischer states that it will improve the scoopability of the sorbet, as it is not as sweet as sugar. I wasn't sure I wanted to go out and purchase a specialty ingredient just to make the sorbets in the book, but after my experience making some of the ice creams, I am highly intrigued! If the sorbets are as good as the ice creams, I'm sold! A variety of unique Ice Creams such as Beetroot Ice Cream and Rice Pudding Ice Cream, and Sorbets such as Peach and Rosewater Sorbet and Bloody Mary Sorbet are followed by chapters for Special Desserts such as Baked Alaska and Ice Cream Cakes, Delicate Decoratives such as Meringues and Ice Bowls, and finally Toppings such as Lemon Sauce and Fleur de Sel Caramel Sauce round out the book. In all honestly, the Ice Creams, Sorbets, and Toppings chapters are probably the only ones I plan on using, but there are some fun ideas in the other two chapters. 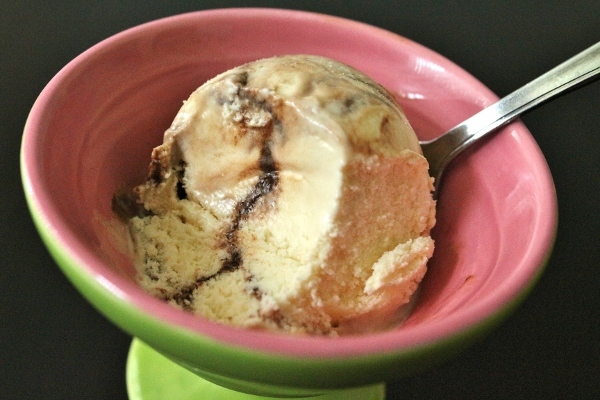 I started my exploration of this book by attempting the Tiramisu Ice Cream with Mocha Ripple. My first thought was, "how is this tiramisu without any mascarpone?" 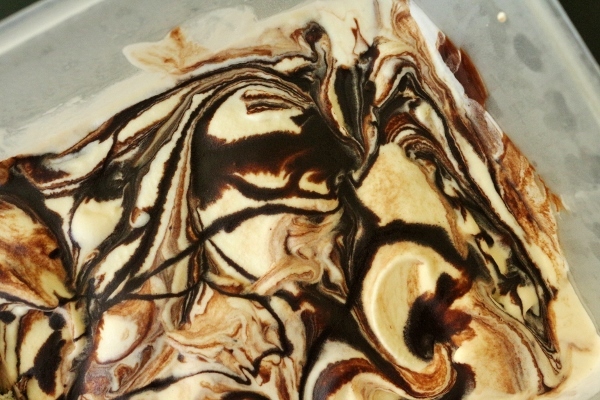 But then after making the ice cream base spiked with Kahlua and rum and then swirling it with the decadent mocha ripple (essentially a glossy and thick mocha sauce) I thought, "what mascarpone?" The result yields the best ice cream I've ever made. Ever. Bar none. 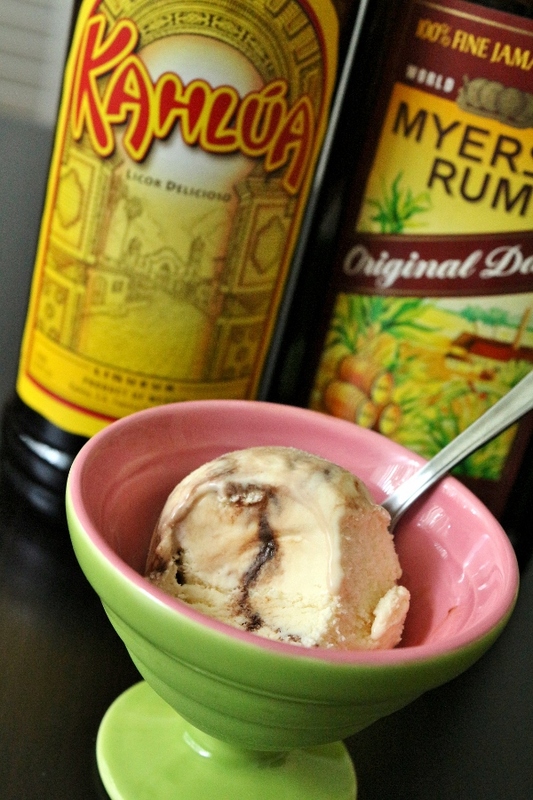 Drunken ice cream with a smooth and silky cocoa-and-coffee infused sauce is decidedly for adults only, but totally worth the calories. 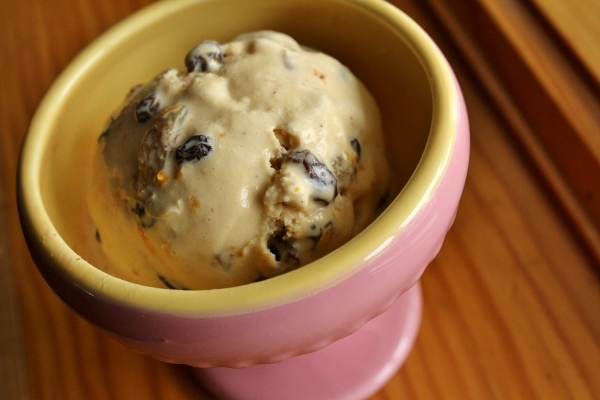 It is easily THE BEST ICE CREAM I'VE EVER MADE. I'm assuming the term ripple is the British version of swirl when it comes to ice cream, and I did my best to layer the ice cream with drizzle of this sauce and then even used a butter knife to try and swirl it around a bit without really mixing it into the ice cream, just to make sure it's evenly distributed. 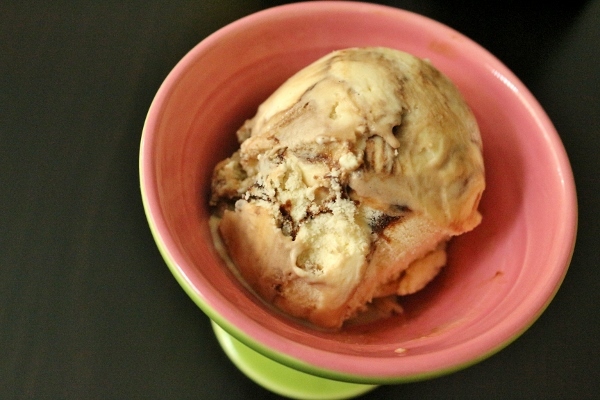 I actually halved the recipe for the Mocha Ripple and only used half of that (so a quarter of the entire recipe for those keeping track) for one batch of this ice cream. I'm saving the other half for another batch to be made sooner rather than later! 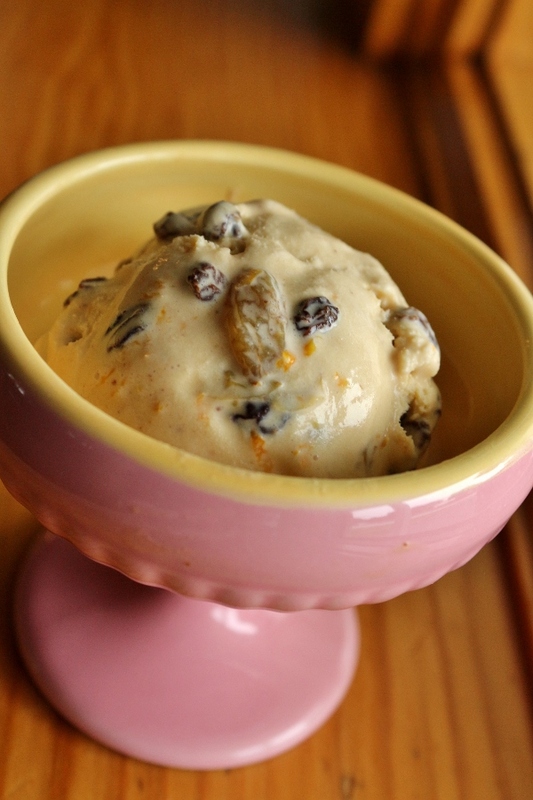 The second ice cream I made from the book is the Rum and Raisin Ice Cream. 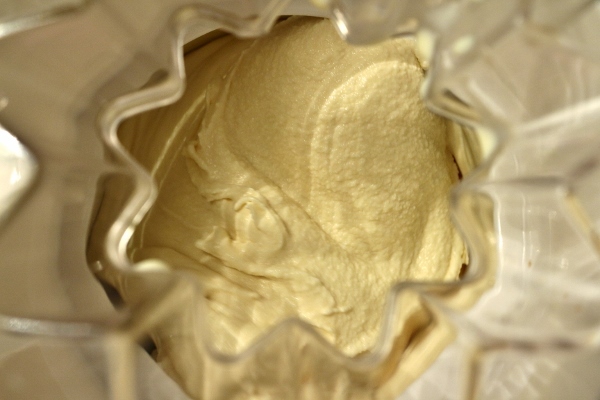 It uses the same ice cream base, but adds a bit of agave syrup. 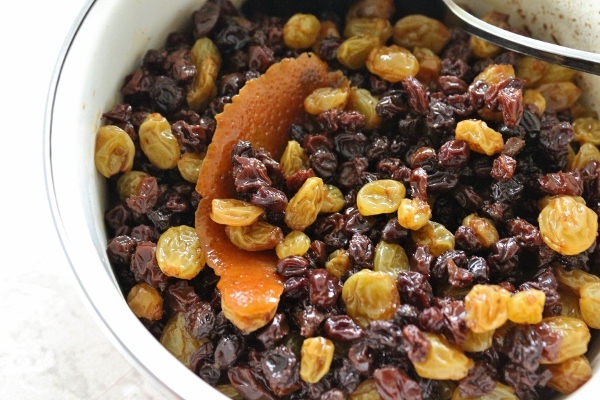 A mixture of raisins (I used sultanas and dried currants) simmer and then soak overnight in dark rum and orange peel, and then are strained, orange peel discarded and the rum syrup is mixed into the ice cream base along with half the soaked raisins and some orange zest. 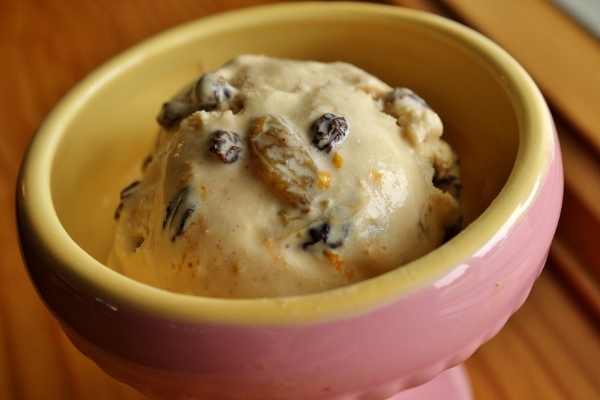 Finally after freezing, the remaining raisins and orange zest are sprinkled throughout the ice cream. Although the ice cream itself was fantastic, I found after a couple bites the raisins seemed to have a slight bit of bitterness to them. I'm not sure if it was rum-related or perhaps a bit of the pith that ended up on the orange rind (I used a vegetable peeler to remove thin strips) that added a bitter note, but it's more of an aftertaste. It's fairly mild but noticeable enough to me to make me wonder exactly why that happened. 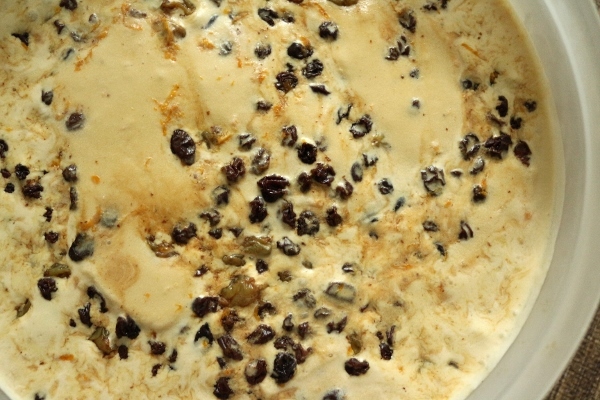 I'm not sure if it was user error (mine) or something to do with the recipe, but I would still say the ice cream was good but a bit too assertive in terms of the bordering-on-bitter rum-soaked raisins. 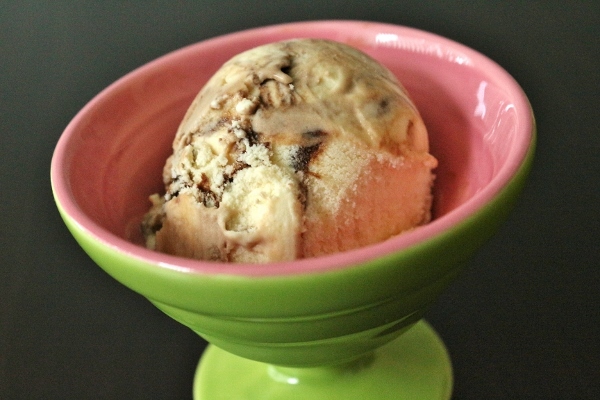 Between the two ice cream recipes I tried, I would definitely recreate the tiramisu ice cream again (and very soon). If I made the rum and raisin, I would cut down on the raisins (it was just too much overall, I think) and maybe hold back a bit on the orange rind since it does sit in the raisin mixture overnight and could release some bitterness from any remnants of pith... the jury is still out on whether or not that was the cause. 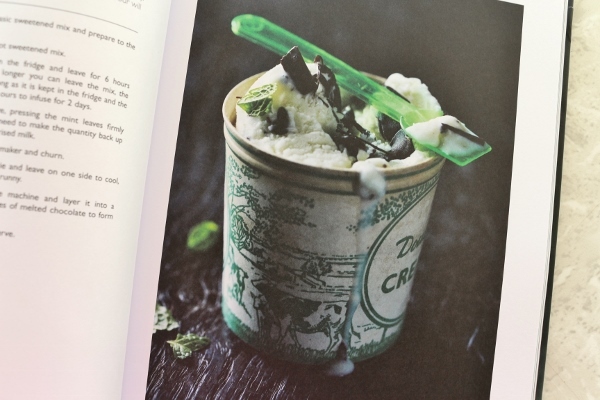 I'm very intrigued by other recipes in the book, and since the ice cream base results in such creamy and delicious ice cream, I can see myself using it to create my own flavors as well. Since the writer is British and the measurements are based on the metric system, the US equivalents are not standard measures. For example for the heavy cream it calls for 17 ounces, but heavy cream is commonly sold in pints, which measure 16 ounces. I simply used 16 ounces heavy cream and made up for it by adding another ounce of milk. 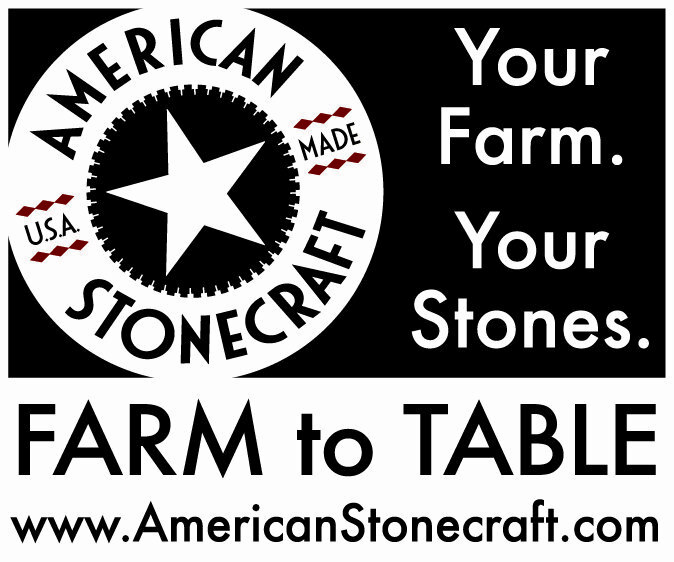 It's pretty simple to tweak the recipe as needed between the two dairy components. I also used low-fat milk instead of whole milk, which is probably a big no-no to ice cream experts, but I don't really care. It was still delicious! There are lots of ice cream books out in the universe, and it's really difficult to say if one is better than the others without actually trying all the rest, but I can safely say that the recipes in Ruby Violet's Ice Cream Dreams are all natural, creative and unique, with lots of interesting ideas for frozen desserts, not just ice creams and sorbets. The ice cream base is perfection and I plan on making other recipes from the book as well as my own creations using this starting point. I'm also looking forward to trying some of the sorbets once I purchase some glucose powder. If you're a frozen dessert lover, this is a great book to check out. Make the base mix by pouring the cream, milk, and sugar into a saucepan. Bring slowly to the boil then remove from the heat and allow to cool a little for about 5 minutes. In a bowl, whisk together the egg yolks and salt until combined well. Slowly pour the slightly cooled milk and cream on to the egg mixture, whisking constantly. Do not use boiling milk as this can scramble your eggs. Pour the mixture back into the saucepan and slowly heat, stirring with a wooden spoon or whisk all the time, until it has reached 85 degrees C (185 degrees F) but doesn't boil. Stir at this temperature for 4 minutes or so. Remove from the heat and leave to cool down to 4 degrees C (39 degrees F) within 90 minutes. Once cooled, keep in the fridge until ready to use. Meanwhile, make the mocha ripple. Whisk all the ingredients together in a pan over medium heat until it starts to bubble, then simmer for 3 to 4 minutes. Allow the mixture to cool. When it is cold it will be thick and viscous, perfect for rippling through or on top of ice cream. Keep in an airtight container in the fridge for up to two weeks. This will yield about 200 ml or 6 3/4 fl oz ripple, more than you will need for this recipe, but it can be cut down if desired. Keep it in the freezer until ready to serve.